SEA provides trained wildlife interpreters to visitors, schools and civic groups in meeting its primary mission of education regarding shoreline habitats and the wildlife along the southern Oregon coast. SEA had about 13,000 visitor contacts at Face Rock/Coquille Point and Simpson Reef during the 2018 summer season. We provide powerful spotting scopes to enable close up viewing of the nesting seabirds and hauled out pinnipeds from the points on which we set up every weekend throughout the summer months. In the Winter months of January through April SEA presents monthly educational seminars on a variety of topics ranging from recent research about local marine life to global challenges facing our marine ecosystems. It is our intention to provide the citizens of our coastal environment with science-based knowledge so that every person can understand the wonderful world in which we reside and our responsibility for its future. HOW CLOSE SHOULD I GET? SEA is also very concerned about the well-being of the marine life we are privileged to watch up close on our coast. While walking along the sand between the South Jetty and Face Rock, you may come upon a bird nest that is so close that you can touch it. DON’T. PLEASE! Stay far enough away from the nest so that the adults in the nest do not act worried or get excited. If you come upon a pinniped (seal or sea lion) pup, stay away. Mother seals occasionally leave their pups on the sand so that they can go feed themselves. They will return. Hanging around the pup will prevent the mother from returning. 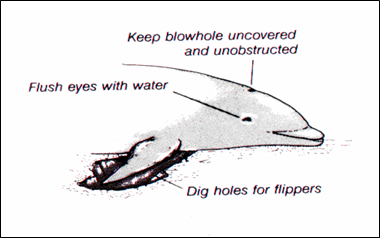 Here are some basic rules to follow if you encounter a marine mammal. 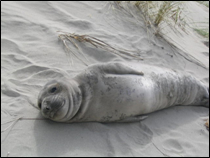 I have taken them from the Oregon Marine Mammal Stranding Network website. They are very clear and helpful. Please read and follow.